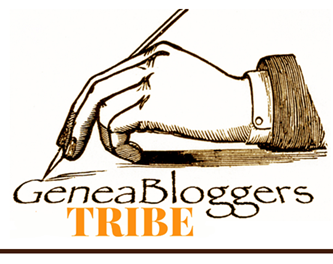 Earlier this month I was nominated for the One Lovely Blog Award by Sharon at Genealogymatters2me and Aillin at Australian Genealogy Journeys. Thanks Sharon and Aillin for this nomination which I’m very pleased to accept…it’s nice to know that others enjoy reading some of my blog. I’m sorry it’s taken me a while to get to this post… a few busy family weeks. One issue with the award is that the favourites tend to get swamped by repeated nominations, while some excellent blogs are unlikely to want to continue the chain. However as I enjoy these sites I thought others might like to look at them too, if they don’t already follow them. 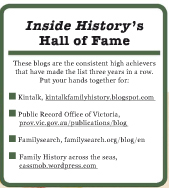 I’ve diversified into non-genealogy blogs for this award, just for the fun of it. * Accept the ward, post it on your blog together with the name of the person who granted the award and their blog link. 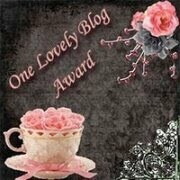 * Pass the award on to 15 other blogs that you’ve newly discovered. * Remember to contact the bloggers to let them know they have been chosen for this award. This post offers some sites to which I pass on this award –some new to me, others old favourites – so you can have a look at them. The Magpie’s Fancy for great writing strategies and insights. French Essence for its wonderful writing and even more fabulous images. I love reading about Vicki’s French life! Chic Provence – I love the image of the pink chair and the flood of pink camellias. Discovering Darwin for some local knowledge tips by someone who recently arrived in Darwin and wanted to learn the ropes. Living Delilah lives in Brisbane, Australia and has an interest in the old-style skills that we used to take for granted, but with a new spin. Dolls Houses Past & Present administered by my friend Rebecca who is passionate about dolls houses and family history and combines the skills from FH to assist with tracing the dolls houses. Mind Gardener for great strategies to re-train your mind into positive and healthy thinking. 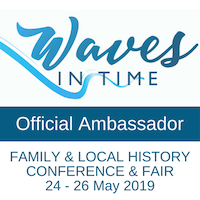 Toowoomba & Darling Downs Family History Society for genealogical news relevant to the Darling Downs in Queensland. Wholesome Cook is another discovery arising from Week 13’s “52 weeks” blog about sweets. On a Flesh & Bone Foundation even though it’s been awarded previously but because it addresses Irish research issues so effectively and because the writing is so good. Family Archeologist for East European and German research. The Armchair Genealogist remains one of my personal favourites for motivating family historians to write their stories. No more wriggling out of writing woman for her family history stories, English interest/travel and addressing mental health issues. Now I need to go and let everyone know they’ve been nominated.